In case you didn't know - Lion's Head is a mountain in Cape Town. 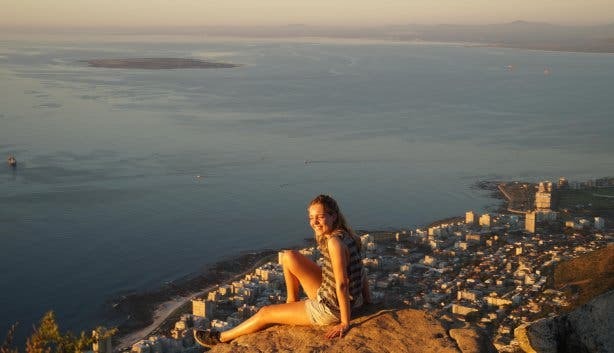 At 669 metres above sea level it's just about high enough to see some cool views of Robben Island (where Nelson Mandela was imprisoned for 27 years), the Atlantic Seaboard and a windy stretch of beach called Blouberg on the other side of the bay. During the 17th century the British tried to call Lion’s Head the Sugar Loaf Mountain. Yes, just like the one in Brazil. The Dutch, however, felt that the mountain's shape resembled a crouching lion and eventually settled on Leeuwen Kop (Lion's Head). The hour-long climb to the top is a popular Capetonian tradition during full moon, but we decided to dangle ourselves off the side of a cliff for two hours instead. Armed with trusty walking boots, a camera and a backpack containing one solitary bottle of wine (you never know when you might need it) I set off for a hike amongst the Silver Trees with a group of ten friends at 16:00 – giving us ample time to reach the summit before sunset. As we emerged from our initially strenuous climb through the undergrowth our path levelled out onto an open space lined with indigenous fynbos and aerial views of Sea Point. Our view of the city changed constantly. Directly above Signal Hill we reached a sign for Lion's Head and with the famous peak in the background this provided an ideal photo opportunity. Our path began to climb towards the peak and became rockier. We passed a small cave where a small child had set up camp and refused to budge until I wickedly told him that the bear might be back soon. Suddenly, I found myself edging around a narrow ledge with nothing but my flimsy grip on a nearby rock to separate me from the far away forest floor. Although cave child couldn't get up there fast enough I was a little apprehensive as I saw fellow hikers scrambling up steel foot holds like it was no big deal. Using rocks and footholds I pulled myself up onto the first ledge before scaling the side of the mountain by holding onto a chain. The last section before the summit saw us navigating an exposed ridge via steel ladders and my friend explained, "My life just flashed before my eyes". 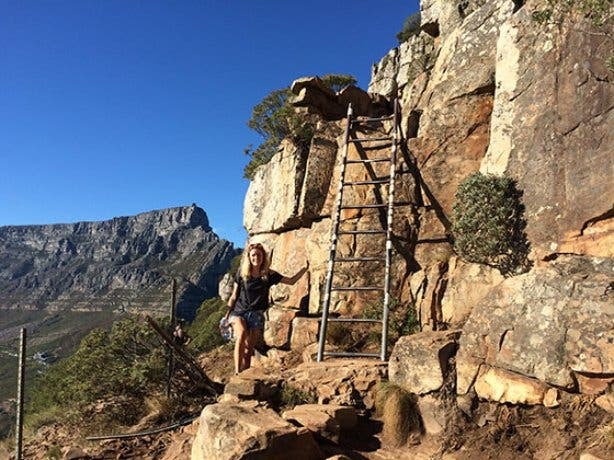 But by the time I'd climbed a few ladders and placed one tentative toe on a rock I was pleasantly surprised to find that the route was rather secure if approached slowly. As long as I didn't look down it was almost enjoyable. Part of the group carried on along the contour path to a point overlooking Camps Bay which leads to a shorter and easier rock scramble to the summit. Crowds of friends sat dangling their feet over the edge of the mountain whilst tucking into picnic food. Aside from the fact that I was impressed with the way I'd scaled Lion's Head the panoramic views of the Mother City and its surrounding coastline were magnificent. We sat sipping a well-deserved glass of red and crunching nachos whilst the sun set over the distant Hottentots Holland mountains to the East in red and gold hues. Once the sun had set it was starting to get dark so we began our descent and I cautiously shimmied down on my rear end. We stopped briefly at the point overlooking Camps Bay to marvel at shimmering city lights. Many people had head lamps to identify loose rocks underfoot and on our way to back to the gravel jeep track that lead to Kloof Nek we saw fire flies flashing in the darkness – a rare and beautiful sight. On this occasion there was one fundamental thing missing from our full moon hike. The moon had a prior engagement and decided to hide behind a cloud. The idea was to watch the full moon rising over a picnic and then follow the same path down by the light of the moon. Although I still had a fantastic experience, I did feel sorry for the American guy who lugged a telescope the size of a small planet up the side of the mountain just to look at that elusive moon. Hiking Lion's Head at full moon is something that you have to do at least once. Whether or not you actually see the moon, the hike to the summit boasts spectacular views and there are routes to suit all levels of fitness. Once at the top the atmosphere is bustling as hikers eagerly await the sunset and the rise of the full moon. If by chance you ever forget it's a great way of reminding yourself why you chose to live in the Mother City. 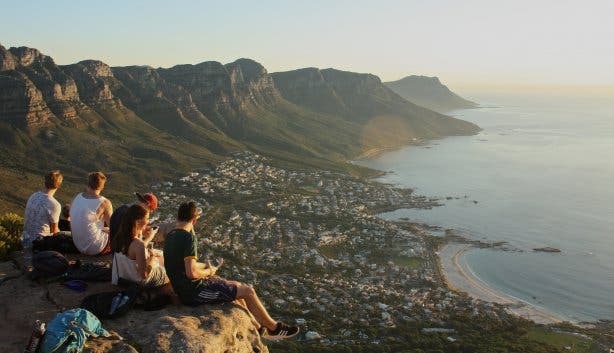 Hiking Lion's Head by day is just as stunning or Table Mountain might be on your list of mountains to scale.